Searching for full time strings teachers! Everyone is welcome to a spring performance of both the YSO's Philharmonic and Symphonic Orchestras at 4 pm in MSU's beautiful Akin Auditorium. 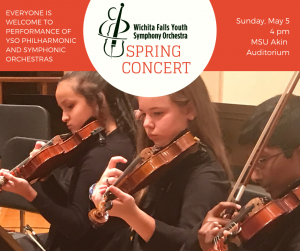 The free performance will also feature small strings ensembles. Enjoy a wide range of music from Tchaikovsky to Copland to Pirate of the Caribbean!